You are here: Home / Ethnic Groups / The People of Sumatra / Who are the Lampung Sungkai? The Sungkai have a strong social structure and make up their own subgroup within the Lampung cluster. The Sungkai are also known as the Bunga Mayang. The Sungkai live in the North Lampung regency. According to their ancient historical records, the Sungkai are likely closely related to the other Lampung ethnic groups. The Sungkai use a dialect of the Lampung Api language. It has several levels of formal language. Most Sungkai also speak Indonesian. Some also speak the languages of local transmigrant groups. They hold to the Pepadun tradition. Pepadun means “chair,” or a seat used by a ruler. Their leadership system is congregational. Many punyimbang (cultural leaders) have a voice in community meetings, acting much like a congress. Family ties among the Sungkai are very strong. The Sungkai clans use a system of consensus for solving issues among themselves. 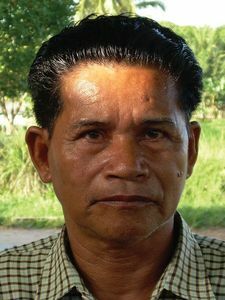 The Sungkai have a strong ethnic identity. They avoid intermarrying and becoming part of one of the larger people groups around them. The Sungkai want to form their own regency on the grounds that they are their own group and should have their own regency. Most Sungkai people are farmers. Their villages are generally small and the boundaries between villages are not clear to an outsider, as the villages are situated very close to each other. Their dwellings have gone from the traditional raised wooden houses to the more modern cinderblock and concrete houses. Almost no one uses the elevated wooden homes anymore. The Sungkai live in close proximity to transmigrant groups. In a few Sungkai villages, outsiders make up the majority of the population. The Lampung Sungkai hold strongly to their Islamic identity and fiercely challenge conversions to other religions. Social interactions with people from other religions are positive, though, and major problems related to religious tensions have not been reported in this area. This shows that religious solidarity is fairly strong in the Lampung Sungkai area. Coffee is a common local commodity among the Lampung Sungkai. Besides selling coffee beans, they also produce coffee powder. In North Lampung regency coffee production is still a home-based industry, in which families produce coffee powder to sell as a source of additional income. Thus, assistance regarding better management of local coffee production and getting the coffee to good markets would greatly help the Sungkai people.